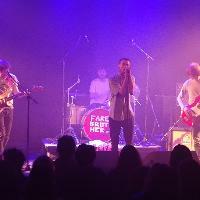 &apos;We Are Parkas, in blunt terms, are the passion that is missing from modern day indie music. Matt Banks (vocals), Owen Stephens (guitar), George Hopkins (bass) and Joe Strauss (drums) met at Bath Spa University in 2015 and since then have been writing and gigging constantly, perfecting their arena sized sound and firmly establishing themselves as Bathâ€™s most exciting prospect in indie rock. Here are the latest We Are Parkas mixes uploaded to Soundcloud.